When it is time for your trial, you want to walk into the courtroom confident in the knowledge that you and your lawyer have explored every issue and prepared the best possible defense. 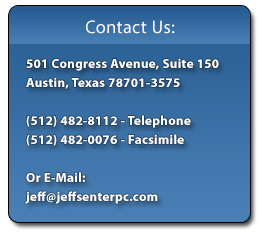 At the Law Offices of Jeff Senter, PC, we provide state and federal criminal defense counsel for the accused throughout the Austin, Texas area. We will put in the work needed to get the best possible results. What Can the Right Criminal Defense do for You? Our firm believes that all clients, even those accused of the most serious federal and state crimes, are entitled to dignity throughout the defense process and criminal defense representation with integrity. In each of our practice areas, from DWI to federal white collar crimes defense, we offer all our clients an honest and candid assessment of their situation. The news is not always good and we will not pretend that serious problems do not exist. Instead of avoiding potential problems, we look for real and practical solutions. The most important work in preparing the best possible criminal defense often takes place before an indictment. We will take early action to protect against the most serious potential charges. Early and effective engagement with the prosecution during the initial investigation can help prevent any charges from being filed or lower the charges and minimize the potential consequences. 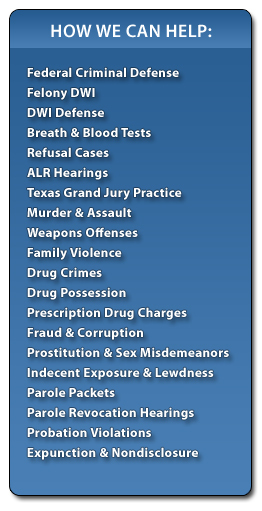 With more than 20 years of criminal defense experience in the state and federal courts of Texas, Attorney Jeff Senter, PC handles a wide range of felony and misdemeanor cases. He brings a unique perspective to every client's situation. Whether you have been charged with a federal offense DWI, a white collar crime, or violent crime, our legal team, led by Attorney Jeff Senter, will take the time to make sure you understand the challenges you face and what we can do to prepare the best possible defense. Throughout the length of your case, our genuine concern for your welfare will never get lost in the shuffle of legal concerns. We understand the stress and concerns facing clients charged with small misdemeanors to serious felonies. Our large and accessible staff will be there to answer your questions and help you through the process. Additionally, payment plans are available. 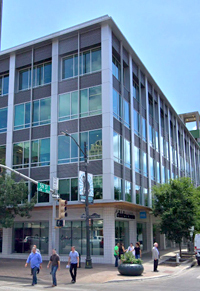 Contact us today to schedule a free initial consultation.